This weekend, Hunter and I headed to Cinebistro to see 42 (so good, btw). While there, I spent some quality time stalking a girl with impeccable style and a fabulous bag to boot. It was black with brown leather straps, and completed with a gold monogram. GASP! Where was this gem from? Madewell! I'm not sure if you realize this, but Madewell has an entire section devoted to monogrammed leather goods. As I am getting married and will be getting new initials, I am monogramming anything that doesn't move. The items below certainly fit the monogram bill, don't you think? I cannot get enough of monogrammed goodies. And that mini satchel is to die for! I actually just launched my blog TODAY! I'd love it if you'd check it out. Oh noo, this is bad news for my wallet! 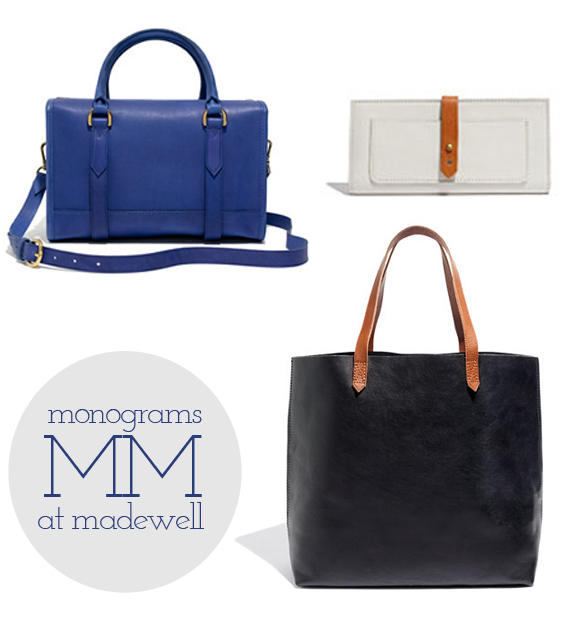 Love monograms + love Madewell, this could be dangerous! !